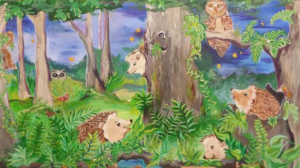 Through a generous grant from the Westborough Cultural Council, the walls at Fales Elementary School were brightened by beautiful murals of the school’s new mascot: Annie the Hedgehog. The artist for the project was Virginia “Ginny” Orlando. Westborough TV was there to capture the unveiling of the large mural in the cafeteria in September 2014.